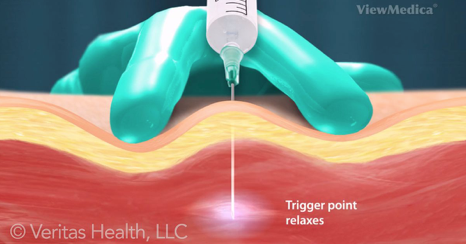 A trigger point injection is an outpatient procedure designed to reduce or relieve pain caused by trigger points. These small knots can form in muscles or in the fascia tissue leading to myofascial pain. Platelet activation plays a key role in the process of wound and soft tissue healing. The use of platelet rich plasma (PRP), a portion of the patient’s own blood having a platelet concentration above baseline, to promote healing of injured tendons, ligaments, muscles, and joints, can be applied to various musculoskeletal problems. It was used as early as the 1990s in maxillo-facial and plastic surgery. PRP injections are prepared from one to a few tubes of the patient’s own blood with strict aseptic technique. After being centrifuged, the activated platelets are injected into the abnormal tissue, releasing growth factors that recruit and increase the proliferation of reparative cells. Ultrasound imaging may or may not be used to guide the injection. Several clinical studies have demonstrated that PRP injections have improved function and decreased pain to various maladies, including - but not limited to - elbow, wrist, shoulder, hip, knee, and ankle tendonosis. Early work is also showing promise for osteoarthritis. The side effects of PRP injections are very limited as the patient is utilizing their own blood, which they should have no reaction to. Some relative rest is needed immediately following the procedure, then usually followed by a progressive stretching and strengthening program. 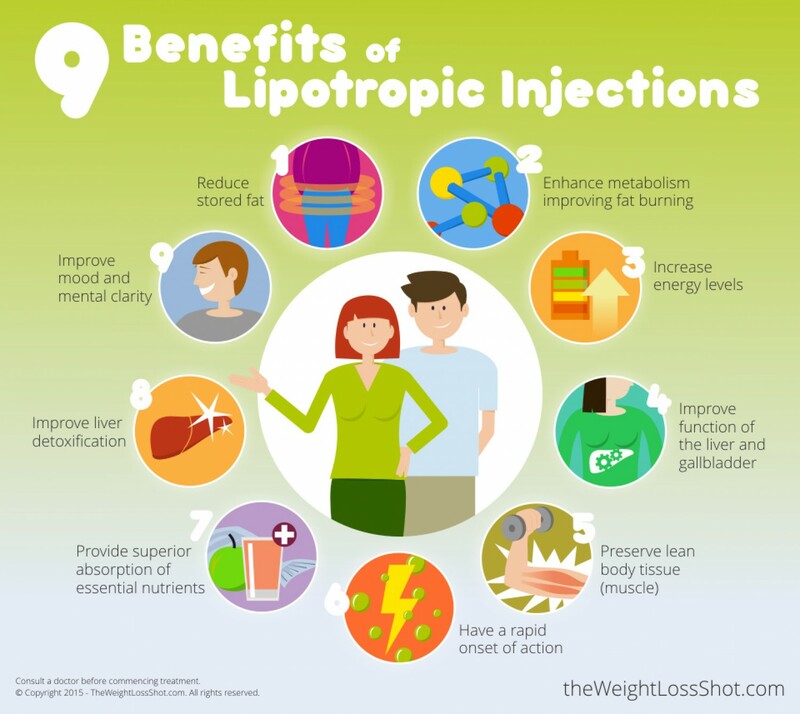 Lipotropic injections are composed of 3 amino acids that are essential for the health of your liver. Your liver is the organ responsible for removing fat and toxins from your body, so if it’s healthier it will work better for you. B12 gives you a huge energy boost, which helps you to burn calories. This vitamin cocktail included in B12 and Lipotropic shots are compounds that enhance liver function and increase the flow fats and bile from the liver and gallbladder. By definition, a lipotropic substance decreases the deposit, or speeds up the removal of fat. See www.myzerona.com for more information about this service. By now you've probably heard about it: the HCG Diet, involves injections of HCG (human chorionic gonadotropin) and a limited diet plan. Cortisone shots are injections that may help relieve pain and inflammation in a specific area of your body. They're most commonly injected into joints — such as your ankle, elbow, hip, knee, shoulder, spine and wrist. Even the small joints in your hands and feet might benefit from cortisone shots. A Kenalog Injection is a steroid injected into the joint space to treat inflammation of the joints or tendons to treat arthritis, bursitis, or epicondylitis (tennis elbow). Kenalog is usually given in these conditions as a short-term treatment of a severe or aggravated episode. Kenalog Injection is also injected into soft tissues of the body to treat certain skin disorders caused by autoimmune conditions such as lupus, psoriasis, lichen planus, and others.